A successful video marketing strategy begins with a business identifying their specific target audience. The nature of a business’s video content will come from understanding a target demographic and how they interact with media. While pharmaceutical companies target senior citizens with TV ads during the National News blocks, the same companies have to sell pharmaceuticals to younger audiences via YouTube video ads. Content marketing comes into play next, as a narrative needs to be crafted to power your business’s message. Marketing goals can only be achieved when prospective customers feel that a product services them. If the video’s content doesn’t target or appease them, then your business is back to square one. 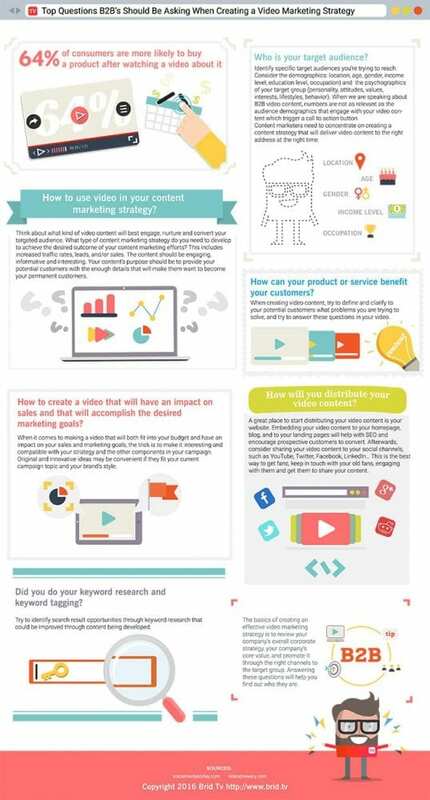 The following infographic from Brid.TV highlights the need to plan out a video marketing strategy. The infographic continues past the normal line of questioning to address technical needs. Does your business need to embed videos, create a landing page or start customizing for social media/mobile platforms? Interest and compatibility are the names of the game here. Any business can understand their organization’s core values, needs and budgetary concerns. But, a video marketing strategy requires key decision makers understanding the world outside of their corporate doors. Check out the infographic and begin implementing the ideas below. If you have further questions, feel free to contact Autodemo.